Note: This legacy guide covers Unity Ads integration in Java using the UnityAds API, which is still fully supported. However, Unity recommends using the UnityMonetization API available in SDK versions 3.0+ to take advantage of advanced optimization features. For more information, click here. 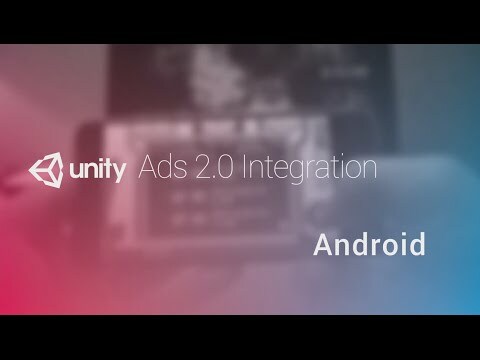 This guide will show you how to integrate Unity Ads into an Android Studio project, i.e. when developing native Android apps. Download the latest Unity Ads here. Log into the Unity Ads Dashboard using your UDN account. If you don't have a UDN account yet, sign up here. From the Dashboard, create a new game project. NOTE: Leave the "targets children under 13" option OFF unless your game is specifically designed for children in the USA. Games for all ages are not required to enable COPPA compliance. Locate the (7-digit) Game ID by selecting your game project. You will use this number to activate Unity Ads. Enable test mode for each game ID under the settings tab. Download the latest release binaries from GitHub, specifically unity-ads.aar. Create or open your existing Android project in Android Studio. Add new module and import unity-ads.aar. Name the module "unity-ads" for example. Open Module Settings for the app and add "unity-ads" module as a dependency. Within the activity that implements IUnityAdsListener, initialize Unity Ads by calling UnityAds.initialize(this, gameId, this) where gameId is a String value set to the game ID of the Android platform, found under your project in the Developer Dashboard. Note: Unity Ads is only initialized once. SDK 2.0 has a more robust network retry logic. So you can safely initialize even without network connectivity. The SDK will request ads when the network becomes available. Unity Ads SDK 2.0 takes activity argument in each show method invocation (this in the above example). See Unity Ads Android API reference for more information on the API, e.g. showing ads for different placements and refer to the example application for an example on how to implement the Unity Ads SDK into your project. If you can't use the AAR packages with your build system, we also provide the same resources in a ZIP file, unity-ads.zip in GitHub releases. You need to do three things to use Unity Ads successfully. Include classes.jar in your build. Manually merge manifest from AndroidManifest.xml. Make sure you include both AdUnitActivity and AdUnitSoftwareActivity activities. You also need to add INTERNET and ACCESS_NETWORK_STATE permissions. If you are using ProGuard, add all lines from proguard.txt to your ProGuard configuration.